The LLT can be used in the diagnosis of dementia and other forms of amnesia and identify milder memory deficits. Clinical Neuropsychologists, Occupational therapists, Speech and Language therapists and all qualified individuals working with dementia and ageing, stroke and other neuropsychological conditions. Memory complaints and memory impairments are frequently identified after brain damage. These memory deficits can be relatively mild, such as mild cognitive impairment, or more severe cognitive damage, as, for example, can be suffered after strokes. With dementia, episodic memory is the most affected cognitive domain. Although there are many tests that detect and measure deterioration in episodic memory, few are designed to measure visuospatial recall and learning, whilst also being suitable for use with older adults. The authors have developed a relatively brief, sensitive measure for this purpose. to minimise irrelevant influences of differences in motor control, drawing ability, or of expressive or receptive language capacity. Areas measured: Visuospatial recall and learning. 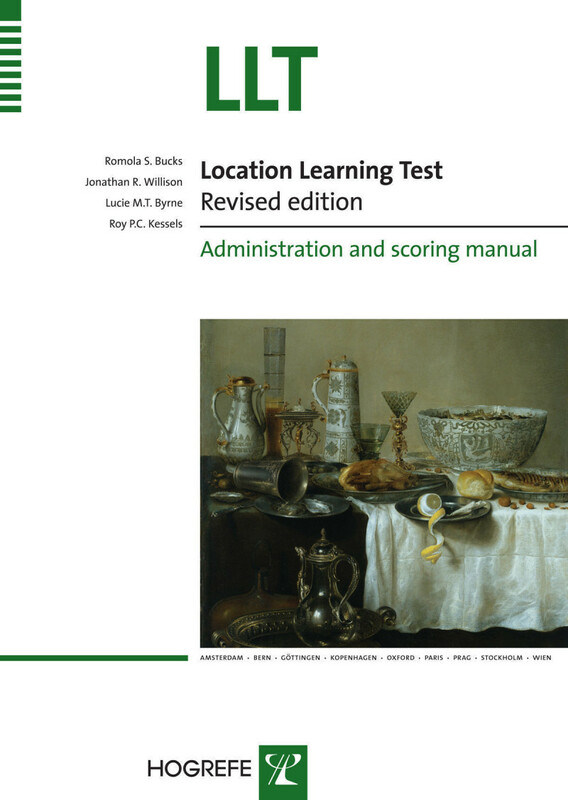 The test allows evaluation of the ability to learn the spatial location of a series of everyday objects, and offers a measure of learning through repeated testing. The LLT also offers a measure of delayed recall, and by combining these two measures, it enables clinicians and researchers to identify a subject who is likely to be suffering from an acquired difficulty with learning and/or difficulty retaining new spatial information. Administration: The LLT test materials consist of a (two-sided) 5x5 picture grid and a blank grid, two practice grids, two sets of picture cards, and forms to record the responses and calculate scores. The test taker is asked to memorise the spatial arrangement of a set of objects on a 5x5 grid. There are two parallel versions (A and B), each of which has ten pictures of common everyday objects depicted on the grid. The test operates by presenting the grid for a set time period and then assessing the subject’s memory for locations by asking them to place cards bearing a copy of each object onto locations on a blank grid. This exercise is repeated five times, or until the subject has completed two correct trials in a row. After a delay ranging from 15 or 20 to 30 minutes, the exercise is repeated once more. Digital Scoring Program: The new scoring program facilitates rapid scoring of the assessment and allows the aggregate scores to be easily converted into a ready-made report. 186 community volunteers, living in the UK.